Acharya Nagarjuna University is based in Andhra Pradesh and was established in the year 1976. Being a state owned university, it has been progressively expanding and increasing its horizons by walking on the path of perfection. Over the last three decades it has included a myriad of new courses not only in the University colleges but also in the affiliated colleges and other professional domains under its arena. ANU is one of the topmost and excellent ranking University in the state of Andhra Pradesh and aims at constantly achieving the mark of excellency. Inaugurated in the year 1976 on 11th September by the then President of India, Fakruddin Ali Ahmed, the university celebrated its Silver Jubilee in the year 2001. About the recognition and accolades earned by the University, The National Assesment and Accredition Council( NAAC) has awarded B++ grade which is around 85 points to Acharya Nagarujna University. The accredition process was held in the year 2003 and 2010. The University is recognized by University Grants Commission, Association of Indian Universities which comes under the Ministry of Human Resource Development, Government of India. ANU has the status of Autonomous State University and is jointly funded by the UGC and Government Of Andhra Pradesh. With over 412 Post Graduate, Undergraduate and Professional Colleges under it, the university embarks upon delivering high quality education to its students. The name of the institution is kept after Acharya Nagarjuna who was an intellectually stimulated philosopher in India. His vision and thought process was beautified with his spiritual insight and he continues to be an inspiring figure even after so many centuries for the people across countries. If you are planning to pursue Masters of Business Administration from Acharya Nagarjuna University, then it offers a whole wide spectrum of specializations for the students to choose from. An MBA degree is essential for those who wish to enter into the industry with a scientific approach to management principles. This professional degree acts a yardstick to ensure quality driven education and offers specializations in order to attain expertise some of the core areas of management like Financial Management, Human Resource Management, Marketing Management, Operations etc. MBA programmes aid the student in developing his/her career to an optimum level and accelerate the professional growth. It primarily focuses on developing an understanding about the political, socio-economical, international,legal and environmental aspects of business. The degree aims at developing the capacity to apply professional knowledge in the form of various disciplines to challenging and dynamic circumstances. Marketing being one of the oldest discipline in the management studies promises a lot of scope to the MBA aspirants. In any organization, Marketing is the life blood and with technological advancements, the role of a marketing professional has improved for better. The MBA degree in marketing focuses on the sales and promotion of the products and services in an efficient and effective way by analyzing the market trends. To pursue an MBA in Marketing Management from ANU the candidate should be a graduate in any discipline other than BFA with minimum of 50 percentage of marks and Maths as a subject at SSC, Inter or Degree level in order to be eligible for the entrance test conducted by ANU. The course is of two years. Money is the strongest motivator and there is always a need for professionals who can help a company to manage the finance. For those who are looking forward to making a career that involves money, MBA in Financial Management will be an invaluable degree. Mathematics, Economics, Financial theories are covered extensively and ANU's distance MBA degree in Financial Management is just the right skill a student might need. 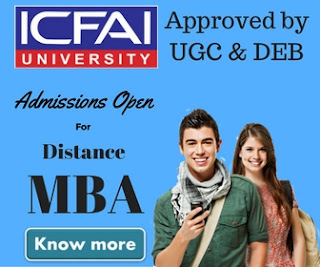 It is a two year course and the candidate should be a graduate in any discipline other than BFA with minimum of 50 percentage of marks and Maths as a subject at Inter, SSC or Degree level in order to be eligible for the entrance test conducted by ANU. Hiring the right kind of employees and developing their skills to cater to the challenges of the dynamic world is imperative for any organization. A human resource manager taps and tracks the right kind of people for an organization and trains them in order to assess their performance in future and also motivate them to strive for better. 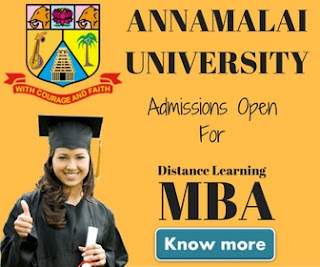 ANU's distance MBA in HR management is again a two year course and the candidate should be a graduate in any discipline other than BFA with minimum of 50 percentage of marks and Maths as a subject at SSC, Degree or Inter level in order to be eligible for the entrance test conducted by ANU. ANU's Distance MBA course in Banking and Insurance equips students with the knowledge and skills in order to make them superior insurance and banking professionals. Not only does the course provide students with a basic understanding of the financial market but it also gives them the exposure to worldwide competition which has in turn led to creation of quality insurance products. The eligibility criteria remains the same. A degree in MBA (Hospital Administration) banks upon the training methodology that aims to provide intensive inputs and lead to development of a high degree of concept based skills, analytical skills and quality-driven technical knowledge to prepare them for the management of healthcare domains. The two year online course by ANU is designed to prepare the budding professional with specialized skills and train them for management of healthcare services with a focus on clinical, information system management etc.